Ray Leach, CEO of Jumpstart, says businesses aren't actually moving out of Ohio -- they're staying and growing. Since 2003, JumpStart has been working to grow an entrepreneurial ecosystem in Northeast Ohio. Its mission is to promote economic transformation by unlocking entrepreneurs' full potential. Jeff St. Clair sits down with Ray Leach, CEO of JumpStart, to discuss entrepreneurism in Northeast Ohio. Jeff St. Clair: What does Jumpstart do? Ray Leach: Jumpstart’s mission is to unlock the potential of diverse and ambitious entrepreneurs to economically transform entire communities. So what that means is we coach thousands of entrepreneurs that are tech startups as well as micro enterprises and existing small businesses to help those organizations create new wealth, new jobs, new economic opportunity. We were founded in Northeast Ohio so that’s still where the majority of our efforts and activities happen, but we do work all across the state of Ohio and in New York. Secondarily, another big piece of what jumpstart works on is access to capital, so we’re investing in dozens of tech startups as well as helping to facilitate conventional loans and lending to more traditional companies located all throughout Ohio. J: When you think of Northeast Ohio, there’s a lot of a big companies, a lot of established companies, but it’s not necessarily a hotbed for new business creation. What are your goals and how are you going to get there? R: To give a broader point of view, from 1990 to 2002 if you looked at the largest 61 economic regions in the United States, Northeast Ohio was the worst performing entrepreneurial region almost for 12 years in a row. This has a lot to do with the startup companies from the end of the 19th century to the beginning of the 20th century. Who ended up becoming major fortune 500 corporations, and we can go down the laundry list across Northeast Ohio – they’re all household brand names. We need more of everything, but probably one of the more important things we need is a continued evolution of culture change. Well, those companies eventually have real challenges, whether it’s globalization or offshore manufacturing. We need more of everything, but probably one of the more important things we need is a continued evolution of culture change. Entrepreneurship was kind of a four letter word fifteen years ago, not just in Northeast Ohio but across Ohio. So as the economy has continued to evolve and change all across the state, leaders, private sector leaders, public sector leaders, philanthropy, all recognize that if we’re going to grow as a region and a state, then small businesses, startup businesses diverse businesses – business led by woman and people of color are one of, if not the most important priority around economic growth at the adult level. 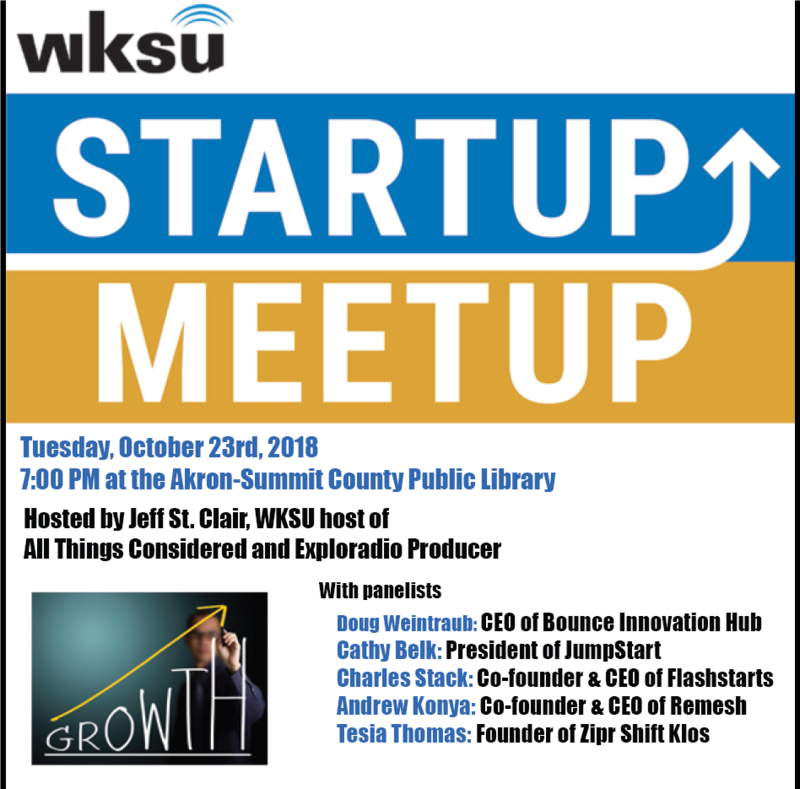 Education is important, all these other issues are also important to the economic growth of our region, but the ability of a community to come together and support its startup companies, its existing small businesses, but also to connect those businesses with larger companies. JumpStart’s been at this for fifteen years. I’d describe the cultural evolution – we’re at about the halfway point. These are typically generational. If you grew up in California, if you grew up in Boston, it would be very normal for your neighbor or your friend of a family would be a part of a startup. That’s really only become normal again in Northeast Ohio in the past ten years or so, that it is a more common reality. J: It’s interesting that you say the biggest problem is culture, it’s not money. You would think you need investors or cohesive markets or something. R: That’s not to say that investors aren’t important, or talent, people who work for startups, people who are willing to take high level of risk. All those things are important ingredients to the ultimate mixture of what makes a vibrant entrepreneurial economy. But the culture permeates everything. As an example, we could have and are having companies that are starting having a lot of success, raising money, generating exits, generating jobs and wealth in our region. But is our community celebrating those companies the way that it could be or should be? It is really about the collective understanding and experience of these companies. For instance, a company based in Northeast Ohio called Wireless Environment. The company had been around for eight or nine years, was founded by a Northeast Ohioan, just recently sold to Ring.com and shortly thereafter was acquired by Amazon. So here we have an example of an incredible entrepreneur, David Levine, built a great company, built a very, very promising business, got acquired one of the hottest tech startups in Ring, and then a month or two later got acquired by Amazon. So how much of our community knows Dave’s story and knows the story of Wireless Environment. That’s an indication of our community’s collective understanding about not only what a great outcome that is, but how important those kinds of businesses are to the economic competitiveness of our region. Those are the businesses that are creating jobs in the dozens or hundreds in a matter of a couple years as opposed to our other businesses that have been the most important mainstays of our economies which are the larger companies. Other parts of the state, Columbus would be a good example, where the entrepreneurial ecosystem, partly because they have 60,000 students concentrated in Columbus… you’re seeing the culture change in other parts of the state more aggressively, more quickly, and so we don’t want to fall too far behind the Columbuses and the Cincinnatis. So that’s another reason why we’re bringing people together, highlighting these companies, doing this collective learning process, but also really celebrating those individual entrepreneurs and the progress that young and small companies are making to grow our economy. J: Ohio hasn’t done well at holding onto these startups. It seems to me the percentage of the overall economy that is made up of new businesses is pretty low. R: One of the misnomers of the startup ecosystem in Ohio is that the companies are moving away. They’re actually not moving away. They are staying and growing here, but what is true is the startup economy nationally is growing way faster than it is in Ohio. So it’s not that we’re not doing better vis-à-vis than we were five or ten years ago. Or, like Wireless Environment, acquired now by Amazon, is growing in Northeast Ohio. So they’re not taking the talent to California or someplace else. They are growing in Northeast Ohio and will be adding likely dozens of employees this year and there’s a real opportunity for that business to grow. While we're doing better compared to how we were doing ourselves five years ago, we are losing ground to other regions of the state, and most importantly the country, who are growing much more rapidly their entrepreneurial ecosystem. So in a lot of things over the last generation or two, Northeast Ohio and Ohio has been a little slower to react, a little slower to generate significant outcomes and impacts. And part of this is the chicken and egg dynamic where we don’t have people who have been there and done that before as entrepreneurs, or we don’t have investors who have a lot successful opportunities to invest in the state. Some of those things are true – they’re less and less true now than they were five or ten years ago, but it is this collective. You actually have to make progress on all dimensions all at the same time, for us to have kind of a break out period of time for our economy. I think we have very real potential to make that happen. That’s going to require more collaboration, continued partnerships with philanthropic, public and private sector leadership. But this ecosystem approach, that you’re only as good as your weakest link, and because we don’t have high-profile investors that are headquartered here, and we don’t have companies like a Google here, we are going to have to continue to work as a collaborative to make the kind of progress that we can, could and should make. J: What are the most promising markets, business sectors for Northeast Ohio? It used to be steel, automotive. I’m not sure those are the ones that are most promising right now. Maybe it’s biomedical, maybe it’s the healthcare industry. How do you answer that question? What are the areas, sectors, that you see the most promise? J: The Global Innovation Center. R: Right, so we’re piloting technologies from those companies, again, from all over the U.S. as opposed to just Northeast Ohio or Ohio. So healthcare’s important, but there’s other important industries going forward. One of them, certainly, is tech discussed around computer science. And Northeast Ohio has historically had less density of students coming out of computer science and that has been a real challenge for us vis-à-vis Pittsburgh, with Carnegie Melon, or even Ohio State, with their computer science and engineering school. So because those disciplines are so important to things like artificial intelligence, alternate reality and virtual reality, Blockchain technologies -- much of this is driven by the computer science discipline. We have lots and lots of medium and large-sized companies that employ people in the computer sciences, in the technology field. But if we’re going to take a step change, to have a much larger impact in those industries, the patented technology and ideas are really here, but we need the talent to help those technologies and help those companies scale. You can look at global trends – healthcare is clearly the most significant major driver in the short term, but we’re really looking for as a region, as a community, the additional technologies that can drive economic growth. In some cases, the industries are obvious, but the pieces and parts we need to catalyze that industry, in many cases still need some work. J: It’s keeping and attracting talent for those areas. A lot of those talented people do want to go to the coasts. So maybe it does get back to culture. R: 46 percent of people who live in Silicon Valley right now, under the age of 35, are saying they are going to move in the next five years out of Silicon Valley. Why is that the case? It’s clearly not the case there’s not great companies they could work for in Silicon Valley – there’s plenty of those. But what is the case is the culture, the quality of life, the cost of living is very, very, very challenging, particularly when you get into your 30s or you want to start a family. We do have people coming back to Ohio and the Midwest in droves now, from California in particular, but also other high-cost places like New York and Boston. A lot of the comparative advantages that Northeast Ohio and Ohio has are now coming into favor. We do have people coming back to Ohio and the Midwest in droves now, from California in particular, but also other high-cost places like New York and Boston. So the time is right. We’ve been doing this work for about 15 years. We’ve got a lot of great successes, handfuls of huge successes and a lot of intermediate and moderate successes. Some of the megatrends around the culture and the economy of the country are starting to play in our favor. All these things are circular. Northeast Ohio had huge advantages in the end of the 19th century and early 20th century around innovation. Entrepreneurially-minded people started great companies, and now it’s kind of coming back around. So we’re really bullish and hopeful that over the next ten years, we’ll be able to double the amount of progress we’ve made in the previous fifteen years. And if we are able to do that, I think we can clearly demonstrate, show and share that Northeast Ohio is a very, very entrepreneurially friendly place that has many more of those ingredients that we are all looking to build and develop right in our backyard.